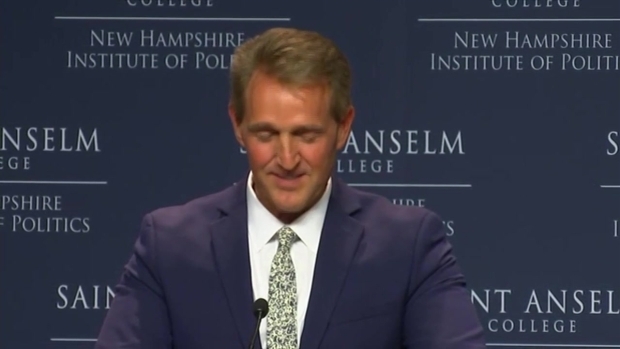 When Sen. Jeff Flake of Arizona spoke in New England Monday, demonstrators called for the Republican to vote against Supreme Court nominee Brett Kavanaugh. The Republican senator who suddenly sits at the center of the explosive Supreme Court debate vowed Monday to ensure the FBI does "a real investigation" into President Donald Trump's nominee as he trekked across New England while exploring a possible run for president. "It does us no good to have an investigation that just gives us more cover," Arizona Sen. Jeff Flake told hundreds of young people at the Forbes 30 Under 30 Summit in Boston. The White House has insisted it's not "micromanaging" the new one-week review of decades-old allegations of sexual misconduct against Supreme Court nominee Brett Kavanaugh. Some Democratic lawmakers claimed the White House was keeping investigators from interviewing certain witnesses. While Flake was on stage, moderator Randall Lane, chief content officer at Forbes, announced news that the White House had just authorized the FBI to expand its abbreviated investigation into sexual misconduct allegations against Kavanaugh by interviewing anyone it wants. Lane credited Flake for the decision. Sen. Jeff Flake of Arizona spoke in New Hampshire after appearing at a forum in Boston. Before the event in Boston, hundreds of demonstrators gathered at City Hall Plaza to urge Flake to block Kavanaugh's nomination. 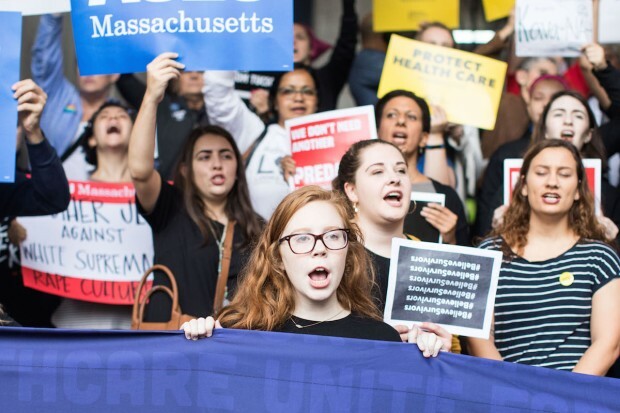 "We're here to send a message to Senator Flake that if you come to Boston, you're going to hear from us," said Rebecca Hart Holder, executive director of NARAL Pro-Choice Massachusetts. 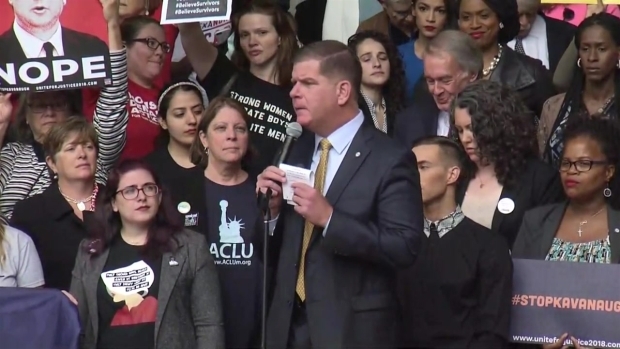 Boston Mayor Marty Walsh, Democratic Massachusetts congressional candidate and Boston City Councilor Ayanna Pressley, Democratic New York congressional candidate Alexandria Ocasio-Cortez, along with advocacy groups and survivors of sexual assault, all spoke at the event. The crowd gathered at the rally carried signs with messages like "No, Brett" and "Kava-NAH." They joined in chants of "Love, not hate," and "Hey hey, ho ho, Kavanaugh has got to go!" Both Pressley and Ocasio-Cortez spoke of their own experiences of sexual assault and harassment. "There are many parts that make up my identity," Pressley said at the rally. "Chief amongst them, I am black, I am a woman and I am a survivor. I have been asked to not come off as outraged or angry for fear of being labeled as an angry black woman. Well, I am angry, and I am outraged because this is outrageous." 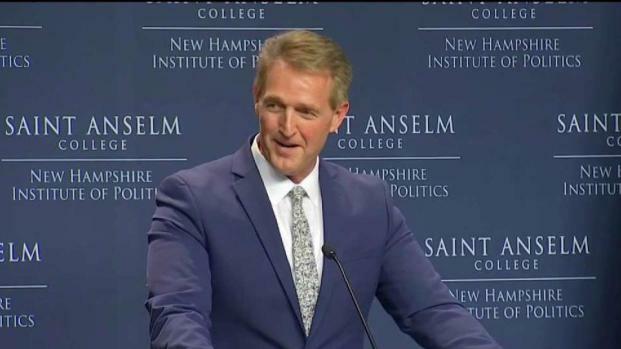 Republican Arizona Senator Jeff Flake spoke at St. Anselm's College in Manchester, New Hamphire and told the audience that tribalism in politics is tearing the country apart. Pressley, quoting activist Deray McKesson, noted that those who are abused or marginalized are not voiceless, "what we are is unheard." "Senator Flake, Donald Trump, Brett Kavanaugh, can you hear us now?" she added. "Look me in the eye when I'm talking to you. Can you hear us now?" Ocasio-Cortez shared several personal stories, including how when she was 18 or 19 years old, at a party in Boston, she saw a girl getting flung over someone's shoulder, unconscious, at a fraternity party, and taken upstairs. "Everybody looked, but nobody said anything," she said. Walsh said Flake should not be receiving praise just for asking for an FBI investigation. “I want to say to Senator Flake, I guess I want to say thank you for asking the question, but that’s your job," he said. "That’s your job to vet the nominee sitting on that committee." Democratic Massachusetts Sen. Ed Markey made clear he is opposed to Kavanaugh because his presence on the court would pose a danger to Roe v. Wade. He also noted the state's long-standing history of launching revolutionary changes and leading progressive movements. U.S. Sen. Jeff Flake speaks with a host at Forbes' 30 Under 30 event in Boston on Oct. 1 as the FBI investigates Supreme Court nominee Brett Kavanaugh after he requested it moments before approving Kavanaugh's nomination to move to the the full Senate for a confirmation vote. "We are Massachusetts. We are the revolutionaries," Markey said. "This is where the abolitionist movement started, this is where the suffragette movement started, this is where the Affordable Care Act movement started, this is where the gay marriage movement started. This is where the revolution starts to say that Brett Kavanaugh will not serve on the Supreme Court of the United States of America." Olympian Adam Rippon, who was also in town to speak at the Forbes event, attended Monday's rally. "As soon as I found out Jeff Flake would be here in Boston, I said, 'Where is the rally?'" Rippon said. Boston Mayor Marty Walsh spoke to a crowd of demonstrators at City Hall Plaza hoping to urge visiting Arizona Sen. Jeff Flake to vote against the confirmation of Supreme Court nominee Brett Kavanaugh. "We need to protect safe and legal abortion," he added. "We need to stand up for victims of sexual abuse. And we need to call every single day and say no to Brett Kavanaugh." Flake later traveled to St. Anselm's College in Manchester, New Hampshire for a speech at the school's New Hampshire Institute of Politics. Flake quipped that he'd always heard that St. Anselm's was a safe place, populated by calm, reasonable people. "I'm counting on this today. 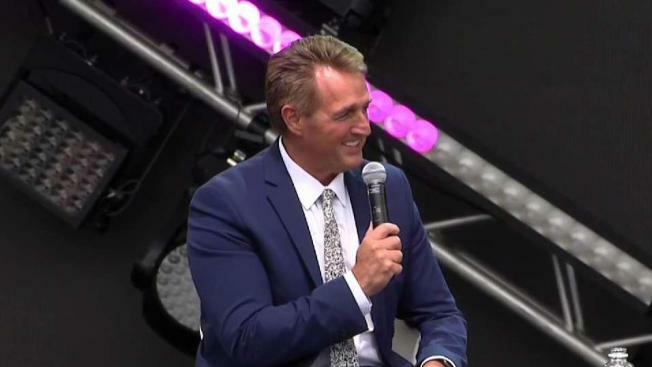 You have no idea," Flake said with a smile, as the crowd laughed. 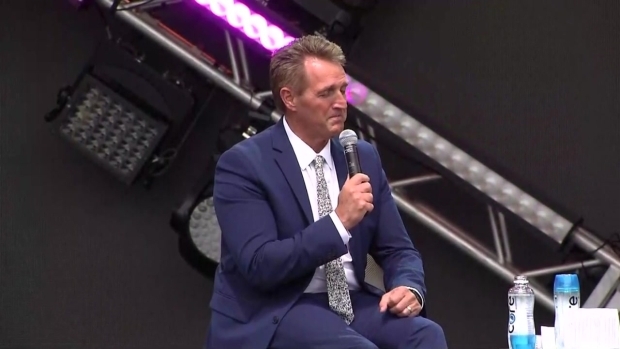 Flake spoke about last week's Kavanaugh hearings and how party loyalists and tribalism affected the process. "My message here today is that tribalism is ruining us. It's tearing our country apart. It is no way for sane adults to act," Flake said. "Ultimately, the only tribe to which any of us owes allegiance is the American tribe." It was Flake's second appearance in New Hampshire this year. He has said a bid for president in 2020 is unlikely, but hasn't ruled one out altogether. "Not really thinking of that," Flake said when NBC10 Boston asked him about a potential White House run. "There's too much going on in Washington now." Monday's Boston event, which also included an appearance by Ohio Gov. John Kasich, was originally scheduled to be held at the Colonial Emerson Theatre, but Emerson College pushed to have the event canceled over "safety reasons." Instead, it was moved to City Hall Plaza. Flake was a central figure in advancing Kavanaugh's nomination from the Senate Judiciary Committee with his tie-breaking vote. Flake said he'd vote to advance the bill to the floor, but asked for a one-week investigation into the sexual assault allegations lodged by Christine Blasey Ford against Kavanaugh. On "60 Minutes" Sunday night, Flake talked about his impressions of Kavanaugh’s testimony, saying, "It was anger...but if I were unjustly accused, that's how I would feel as well. As it went on, I think his interaction with some of the members was a little too sharp, but the statement at the beginning I thought was pretty raw, but in keeping with someone who had been unjustly accused."